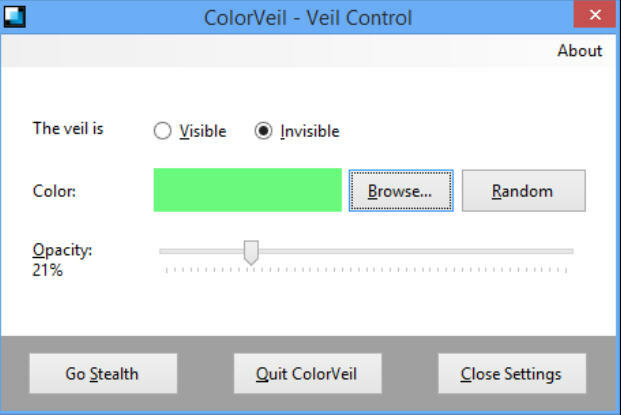 ColorVeil is a free Windows app with a single purpose: to place a color filter over your screen, reducing brightness and cutting eye strain. The program is a tiny download -- 21.8KB, really? -- and immediately applies a default filter on launch. Right-click its system tray icon and a settings dialog appears when you can choose your preferred shade and opacity. Once it’s running, the filter will affect the desktop, videos and most regular applications (though maybe not games). If ColorVeil gets in the way at some point -- you’re editing images, perhaps, and need to see colors as they really are -- then left-clicking its system tray icon toggles the effect off, and on again. You also get a "Stealth" option to hide the program from the taskbar. Run it on someone else’s system when they’re not looking, go stealth, and you can leave them wondering why their screen is so much greener than it was yesterday. There’s scope for further improvements, maybe with a customizable hotkey to apply the effect, or a command line interface where you could set colors from a script. ColorVeil carries out its core task well, though, allowing you to apply a custom color tint with a click, and if that sounds appealing then you should definitely give it a try.